There are two different educational philosophies, and now five proposed attendance maps, up for debate as the Loudoun County School Board considers how to redraw elementary school boundaries in Leesburg. Attendance zone changes have to be made in the town to reduce overcrowding at Evergreen Mill Elementary School. But the board seems to be split on whether to reassign just a few hundred students to bring down Evergreen Mill’s enrollment, or make major changes to fix what some consider an unfair distribution of the town’s poorest and non-English speaking students. When attendance boundaries were drawn in 2006 and again in 2011, previous board members adopted a model that assigns students in some of Leesburg’s low-income neighborhoods to schools as far as 3.5 miles from their homes. The idea was that students would do better if schools were more socioeconomically balanced, as opposed to leaving one or two schools with high populations of poor students. The first proposal, Plan 1, was presented by the district’s Legislative and Planning Department last week. It leaves students in apartments near Plaza Street in Leesburg divided into three different schools, and moves just 149 students to different schools. It moves a neighborhood on Clubhouse Drive (known as planning zone CL 28.3) from Evergreen Mill Elementary to Catoctin Elementary, and reassigns students in a planning zone north of town (CL 03) from Lucketts Elementary to Frances Hazel Reid Elementary. It would still leave Evergreen Mill’s enrollment 20 percent above its building capacity. Three board members presented four new proposals during a meeting Thursday. Plan 2, drafted by School Board member Eric DeKenipp, is similar to Plan 1 but moves more students from Evergreen Mill Elementary to bring that school’s enrollment just below it’s building capacity of 600. It also reassigns students in the Beacon Hill neighborhood northwest of Leesburg from Catoctin Elementary to Kenneth Culbert Elementary in Hamilton. “We have significant capacity available at Culbert, and I found it hard, as I went through various options, to not make that move,” DeKenipp said. His second proposal, Plan 4, would move more students but it would also return students who are bused several miles back to their neighborhood schools. The biggest change is for students who live in apartments and townhomes along Plaza Street; they would be reassigned from Evergreen Mill and Cool Spring to either Frederick Douglass or Leesburg Elementary, both within walking distance. The proposal does leave students in one planning zone in that neighborhood, labeled CL 20, at a school they would need to continue to ride the bus to, Frances Hazel Reid. School Board member Beth Huck (At Large) presented her map, Plan 3, which primarily assigns students to the schools closest to them. The down side of the proposal, she noted, is that it would leave three-fourths of the students at Frederick Douglass Elementary qualifying for the federal free and reduced lunch program. 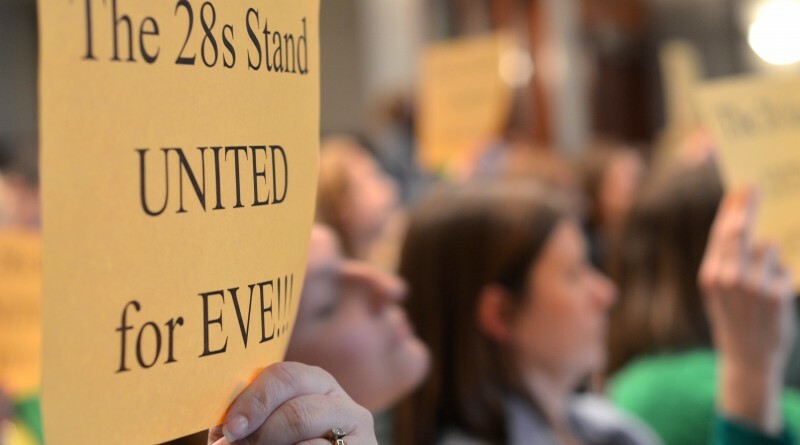 Her plan sparked the most conversation among board members, with a few registering their opposition and a few saying they were open to the proposal, even if it meant having a lot of low-income students at one school. “This is a no way for me,” Joy Maloney (Broad Run) said. She cited research that indicates students’ achievement goes down when they’re in schools with a majority of low-income students. Plan 5, proposed by Chairman Eric Hornberger (Ashburn), which is similar to Plan 2. It reassigns about 800 students, including those in several planning zones along the west side of Rt. 15 and south of Leesburg. It would move students in Woodlea Manor and Country Club neighborhoods from Evergreen Mill to Catoctin. It would also move Beacon Hill students to Kenneth Culbert. Hornberger cautioned board members against plans that, while well-intentioned, reassign more than 1,000 students. He referred to plans 3 and 4 that would return students to schools closer to their homes. “One thing I do know is that moving at risk-kids is very difficult for them to adjust as opposed to kids who have other support at home,” he said. Board members are expected to present other proposals in the coming days. The board will hold one more public hearing March 14 ahead of adopting a map March 29. The hearing begins at 6:30 p.m. and will be held at the Loudoun County Government Building, 1 Harrison St. in Leesburg. I find this truly unbelievable. In 2010, the Frederick Douglass Elementary School bonds were on the ballot and being proposed as the ultimate solution to Leesburg elementary over crowding and bringing “equity” to Catoctin and Balls Bluff ES, where parents were up in arms over having too many ESL and Free and Reduce Lunch kids in their classrooms. Sam Adamo and other people in the administration said this would solve the Leesburg school boundaries for years. There would be NO need for boundary adjustments at all. No need for a new middle school or high school either. Douglass opened in 2012 and even when the Board of Supervisors was looking at Tuscarora Crossing just a year ago (a 450-house development), we were told a new elementary school was not needed — even if that development was okayed, which unfortunately it was approved. So, here we are, just four years later, with a new School Board having to deal with the most difficult task possible — readjusting elementary school boundaries. The Douglass boundary change, though less controversial, resulted in litigation. Why were we told Douglass would solve everything? I caught heat by opposing the construction of the school, too. So, what is going on here, given the fact the Town of Leesbug has approved fewer than 1,200 housing units since I served on Council (2006-11). Tuscarora Crossing is not even pushing dirt? My theory is this — that the schools staff can never accurately project new students because they don’t take into account empty nesters leaving town and selling their homes to families with kids. They don’t know the birth rate and when a development proposal comes in with a proffer to provide FREE land for a school, the staff writes their reports to the Supervisors to make it look like the development really won’t trigger new students. Finally, the School Board and Board of Supervisors have dropped the ball on updating the 2010 School Capacity guidelines, which still call for elementary schools to have just 800 students — some less — 1100 for middle schools and 1800 for high schools. School staff want to build more and more schools and don’t like portables, or efforts to increase the core facilities (lunchroom, primarily) so elementary schools can be bigger. Middle and High Schools could easily be enlarged to 1350 and 2000, respectfully, without increasing the core facilities (just adding 3 more classrooms to the high schools, which costs but $6 million, as I recall) So, instead of allowing families to stay in the schools they are comfortable with by making them larger, they readjust the boundaries and create all this havoc. Terrible policy. This may be my only portal for offering comments, but I wanted to convey my thoughts as they go much deeper than the average person as my daughter attends EMES. This situation centralizes specifically around the at-risk, low-income students, which will always be at the forefront of the NEA and our various governments, which I understand, but my focus revolves around my child and main priorities including her health/safety, educational opportunities and numerous other variables (too many too cite). Realizing that my child’s health is my main focus, she contracted Kawasaki Disease less than 4 months ago and spent nearly a week in the hospital, which was the most emotionally and physically and draining experiencing a parent can experience. The disease could have easily killed her and now she needs to have bi-annual heart monitoring for the remainder of her life. We don’t know what her future holds. The county has done a good job locking the front doors in an attempt to prevent a situation like Newtown, and safe-guard the children, but what provisions have been accomplished to protect our children from within the school when a 3rd world virus is manifesting in some of the children. We don’t have all the answers on our end, as we didn’t do anything or go anywhere before she contracted the illness, except school. Our daughter doesn’t fit any of the statistical categories for contracting the illness. The Loudoun County and Virginia Department of Health websites have some limited information online. It seems like we receive calls when there is a flu outbreak, weekly updates for this and that, but not when someone contracts Kawasaki Disease. Why not? I would certainly want to know if someone in my daughters class or school contracted the disease or something similar like TB. Why a call from the home room teacher, but not the Principal or someone higher up in the County? I voiced to my wife, after my daughter missed an extended period of school, that I would have immediately put my child back into a private school, but I wanted her to grow up in a diversified, BUT SAFE, school. Realizing, we have financial constraints, private school isn’t an option. At this point, I want my child in a school that has as few at-risk, low-income students at I don’t want my child to assume a HIGHER health risk. I can also offer that when 25-33% of the children are not fluent in English, all students (and parents) suffer. I realize there are many, many races in the Leesburg area, but it slows all of their learning development and dummies-down the entire class. I apologize if any part of this comes across as being insensitive, but I recently had a single, liberal acquaintance essentially convey that in the social justice realm often you need to sacrifice a child or two for the good of mankind. Kawasaki Disease (KD) is not contagious. To educate yourself on this dangerous illness–which affects people of all racial and ethnic groups–you might want to visit the “What is Kawasaki Disease?” page on the Kawasaki Disease Foundation web site at http://www.kdfoundation.org/index.php?option=com_content&view=article&id=112&Itemid=31 Other areas on the web site have plenty more information that you would probably find helpful as you continue to care for your daughter post-KD. I know I have found it helpful since my son contracted KD ten years ago. At the very least, you can rest assured that the reason no one from the school notified you about KD is because it’s impossible for your daughter to have caught it from anyone at school, or anywhere else for that matter. Ken – as a politician, you are probably being sensitive to the 800 pound gorilla, which are the “unaccompanied minors” and other “illegals” that keep showing up in our schools that can’t even remotely be tracked until either the Federal government drops them off on our doorsteps or they “show up at school”. I asked my wife if the subject came up at any of the meeting(s), but I don’t believe so because it was racially sensitive. Once again, my pimary issue is the health, and to a lesser to degree, abilities of the children surrounding my child. I don’t think most of us parents have any confidence that after the final vote, and the two new communities are constructed, that our children will remain in the same elementary school through the 5th grade. I wonder if our Board members understand that some of us specifically bought houses in Leesburg because they were specifically zoned to certain schools. I am zoned to Frederick Douglass. If I’d seen the demographics on the zone saying 3/4 of the school was reduced lunch and whatever percent of that was ESOL (english as a second language), I definitely would not have bought the house I did. I am not self-segrating, I’m just trying to find the best possible school for my kid. Therefore I find it highly unfair that the Board would just change the school zone without taking home owners into account. I also believe it would be a severe hardship on Frederick Douglass to take on such a high number of low income, and probably just as high percentage of ESOL students all at once. It makes much more sense to disperse this group of students out to several different schools so that each school can devote their resources towards working with a smaller amount of students. That being said, if Frederick Douglass is going to have 1/2 – 3/4 of its students being ESOL, are they going to start offering Spanish immersion? I would hope so since my kid would need it just to understand his classmates and teachers. I am not being racist, I’m being practical. I want my child in a diverse school. What I don’t want is for him (native English speaker) to have a substandard education because his teachers are spending 1/2-3/4 of the school day teaching students to speak English instead of covering required material. I also don’t understand how the concept that keeping students in schools near their communities is somehow beneficial. I do believe there are schools in the south that bus students to different schools to maintain the appropriate desegregation levels. Why is it ok down in the south but not in Loudoun? If anything, putting these students in a school where there is more parent involvement is better for them. Consolidating them into one school, when their parental involvement is already at a lower level, would consolidate the low parental involvement all in one school. What I think is happening is that our Board wants to effectively create a “inner city” school where they pack all the lower income, ESOL students into one school. Put all the “trouble makers” into one school and then forget about them. That way all the cushy rich people in the outer neighborhoods don’t have to deal with them.